Quick! The school's big Halloween party is just around the corner, and your girl has been anticipating it for months! The trouble is, her pop-up psychiatric booth on the playground has been so swamped lately, she hasn't had time to figure out a costume. That's a unique problem; we don't hear of that one too much. But wait...a psych booth, you say? As in, a pop-up place for her friends to get advice and help? Hmmm...we may have an idea for her Halloween woes! Lucy van Pelt runs a similar operation in the Peanuts universe. She's also smart, in charge, and sassy, like your girl! She loves a good prank, she thinks outside the box, and she doesn't let anyone (but Snoopy) get the best of her. 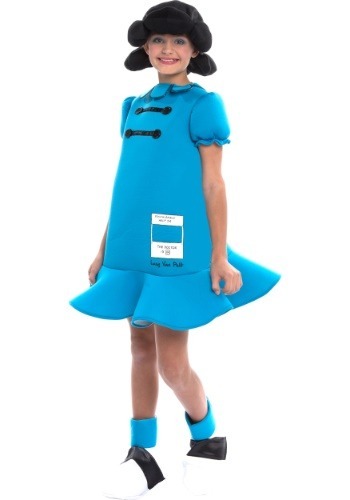 We think this Peanuts Girl's Lucy Costume is the perfect fit for your girl's costume party. The best part is, she can rally her friends and make it a Peanuts group theme, including a Charlie, Linus, Snoopy, and...we bet there's someone she'd just love to see dressed up as Schroeder (wink, wink)! This costume is simple to throw together at the last minute because it includes everything she needs (besides the gang of friends and signature 'tude). It comes with Lucy's iconic black flipped locks (in wig form), her blue, puff-sleeve dress, and shoe covers that turn your kiddo's kicks into Lucy's signature saddle shoes. The dress' silhouette and material give it fun, cartoonish flair. And she'll look perfect behind her pop-up psychiatry stand—just like Lucy! We love your girl's entrepreneurial spirit and go-getter attitude (even if she did slip up on Halloween prep a bit). She seems like she has the personality to be a real leader and boss someday. And if anyone knows about being the boss, it's Lucy!